In Grade one I was so good at headstands I got a part in the school play because I was the only one in the whole school who could balance for the entire scene. It was riveting, so I was asked to do it again the next year. I can still do a headstand, but there's not a lot of theatrical demand for that particular skill any more. So I've moved on to handstands. Any temperature below 21 deg Celsius gets my teeth chattering – another reason I love living in the tropics. My family sometimes call me Darla (from Finding Nemo) because I am not good at keeping fish alive. But I have successfully looked after one husband, three boys, two beagles, one cat, one budgie and three thousand worms – all at the same time, and they are all doing fine. The fish just need to toughen up. ** Update** The worms are now dead – it seems if you can’t make a noise in this household, your chances aren’t good! **Another Update** the beagles have now passed on as well (old age though - not my fault), the budgie's gone to another household, but I just can't get rid of that darn cat! In my opinion, feeding broccoli or brussel sprouts to children is a form of child abuse. I would rather run ten kilometres than wash one window. ….but if I extrapolate that to my whole house, that would mean I’d rather run 170 kilometres than wash all the windows in the house – and I don’t think that’s quite true! When I was 11, a girl at school told me that I would never get a boyfriend because I had no calf muscles. Luckily for me I grew up during the only era in history when leg warmers were fashionable, so I was able to hide my grotesque calf-less legs and fool a few guys for a while. I love Chuppa Chups, pistachio nuts and summer fruits. I started writing when I had three little boys at home and lots of spare time – huh? Well, what spare time there was had to be filled with either housework – or something else. Of course, something else won. I dabbled with writing and got hooked. It’s the BEST JOB IN THE WORLD! 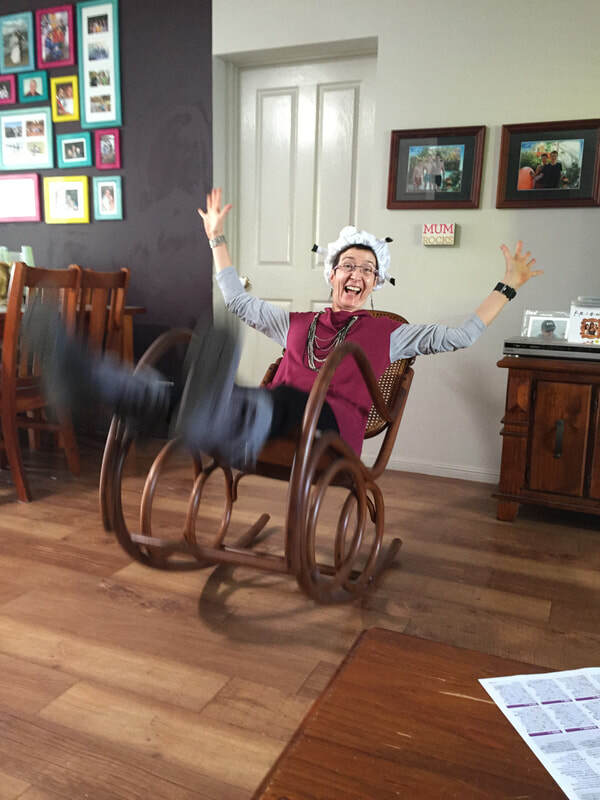 Silliest thing I ever said – ‘Oh yes, the contractions really are quite strong – it’s just that I have a high pain threshold.’ Turns out I don't. It's not even a middle-of-the-range threshold. I think the midwives are still laughing. I am blessed with the most amazing family and friends. Yes, that's a cow shower cap on my head. Because that's how we wise and distinguished people rock.